The Federal Reserve’s policymaking committee raised its key interest rate Wednesday from 1.25% to 1.50%. The dollar fell following the decision, and gold spiked. 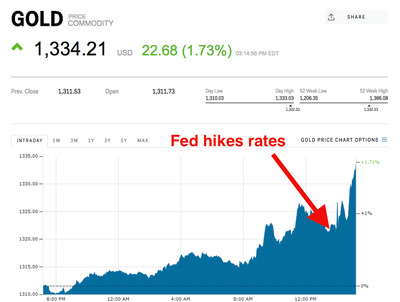 Follow gold in real time here. Gold is rallying Wednesday, up 1.73% at $US1334 an ounce, after the Federal Open Market Committee raised its benchmark interest rate 25 basis points to a range between 1.50% and 1.75%. The dollar fell after the Fed’s decision as the central bank signalled that there will be two more rate hikes this year, drawing more investors toward gold. Some market participants had speculated the Fed could turn a bit more hawkish and suggest a fourth rate hike in 2018. Gold is up 1.18% this year.